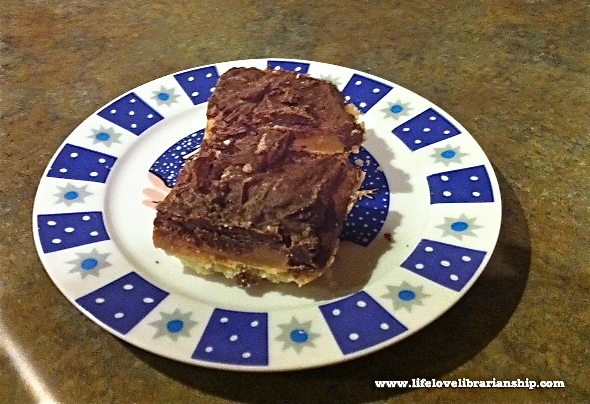 I have no idea why this is called Millionaire’s Shortbread. Perhaps because it makes one feel like a millionaire while eating it? Of course, after you’re done you feel like a glutton because they’re so rich. Ha! Rich! Get it? Anyway…this is a nice, easy dessert that will leave everyone smiling. I mean, who doesn’t like chocolate over caramel over a buttery crust? Preheat oven to 350°. Grease an 8×8 baking pan and set aside. To make the shortbread: put flour, sugar, and salt in a food processor and pulse once or twice. Add in the cut up butter and pulse until it resembles peas. Pat out into the prepared pan. It will look weird and too dry, but go with it. Bake for 20-25 minutes, or until the edges are golden brown. Place pan on a wire rack to cool completely. For the caramel layer: combine the condensed milk and butter in a small saucepan over medium heat. Stirring constantly, bring the mixture to a boil. Continue stirring until it is amber in color and thick, about 15-20 minutes. Pour the caramel over the cooled shortbread and set aside to cool to room temperature. Chocolate layer: Place chocolate chips or broken-up pieces of chocolate bars in a microwave-safe bowl. On medium power, heat the chocolate for 30 seconds. Stir, and continue to microwave in 15 second intervals on medium power until chocolate is completely melted and looks spreadable. Spread over the cooled caramel layer. Refrigerate until chocolate hardens, then slice. Cookies can be stored, well wrapped, at room temperature. Hello Liz, I baked these yesterday and my family loved them. As I doubled the recipe, I was able to hide some in a tin for Christmas. Happy holidays and thanks for sharing!